Unless you choose unfinished, or a natural oil finish, all products are sealed with acrylic lacquer. Dye stained products will get three or four coats of clear lacquer over top. Clear lacquered products will also get three or four coats. DISCLAIMER: Hot items, alcohol, and other acidic chemicals may leave discoloration or damage the finish. If you are concerned about the durability of a lacquer finish, please contact us, or order your product unfinished and apply a sealer of your choice. 100% Burn-In Technology in a Water Based Formula EM6000 Production Lacquer (EPLv8.0) is an ultra clear, water based acrylic lacquer that utilizes advanced polymer resins and HAPS-Free solvent technologies to provide a unique, self-leveling wood finish designed for commercial and industrial applications. EM6000 water based acrylic lacquer is formulated for use in furniture, cabinet, interior architectural and custom woodworking applications, and provides a fast drying lacquer system with exceptional clarity, outstanding adhesion qualities and a nitrocellulose-type appearance and performance all in an Ultra-Low VOC (ULVOC), 100% water-based system. 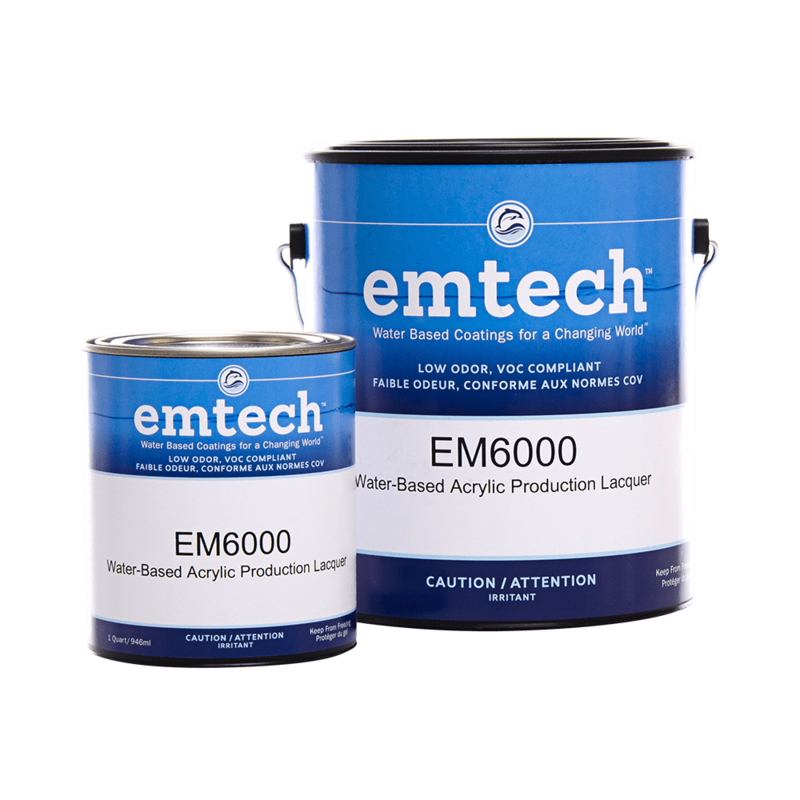 EM6000 Production Lacquer features a unique adhesion characteristic that allows it to bond to a wide variety of properly prepared substrates such as synthetic wood panels, carbon-fibre, PVC, ferrous and non-ferrous metals. This feature gives great latitude of use for the finishing professional when working with EM6000 Production Lacquer. When used as a self-sealing system EM6000 Production Lacquer offers fast drying and sanding features identical to those of traditional nitro-cellulose lacquers and CAB acrylic systems. EPL generates excellent clarity and color definition when used with other sealers or as a stand-alone production finish. EM6000 water based acrylic lacquer is non-flammable, low in odor and cleans-up with water.